Tethering download speed being throttled or what? I've gone through the steps with a rep of resetting my apns, etc. etc. and nothing changed. I tested it with a second phone (OnePlus 3T) and get the same exact result. Is the download just being throttled for some reason when tethering or is there something happening with tethering for oneplus devices? Re: Tethering download speed being throttled or what? This is not a bug. It's a feature. I recently switched over from a Select Choice plan with many GB of high-speed tethering to a 55+ plan with throttled tethering and I can tell you that the difference is shocking. To be more precise, if you have the base T-mobile one plan your hotspot data is throttled to 3g speeds. If you have One+ you get 10Gb of LTE data. Although that data is treated differently and is de-prioritized. Finally there is One Plus International where you get unlimited hotspot LTE data. Hope the info helps to clear things up. Now, activate HD video streaming and 10GB of high-speed Mobile Hotspot data for no extra charge. You will also get unlimited data in 140+ global destinations at twice the speed (up to 256kbps), included free. T-Mobile ONE includes unlimited talk, unlimited text & unlimited data. Changes made in the middle of a billing cycle will result in full monthly charges of the new feature. So shouldn't I be getting the full speed and not be getting throttled? Are you using the T-Mobile "Mobile Hotspot" app? magenta4482025 - One Plus should get your 10GB of LTE data. Give support a call and see if they can work it out. I'm using the built-in android hotspot. I don't see any "tmobile mobile hotspot" app on the play store. My tmobile app does show 0.5GB/10GB of tethering usage though which makes it seem like it thought it was using LTE even though the speeds weren't LTE? I'll give tech a call and see what they say. I came back and just wanted to say that no you should not be getting throttled like this. However, there have been other threads on this forum from users with Oneplus phones suffering from this issue. If you have a chance to test your sim in a T-mobile branded phone it would be greatly appreciated. When you call tech I hope they would suggest something similar because they have a tendency to go the route of its a unlocked device not sold by the carrier. Which is true mind you but it does support the network. I have a old Xperia z3 I can put my sim into and test in a few days. I'd be very confused on why only download speeds of tethering would be unsupported on my phone while everything else works without issue. T-Mobile really messed up tethering trying to get a handle on data usage. I have not seen your particular problem before but suspect that the absence of the tethering app may be defaulting you to the lower speed. Still can't find any tmobile official tethering app on the google play store so not sure what to do about that. Were you able to test the tethering in your Z3 to see if it works? I'm also curious if you've reached out to our Tech care to see if they could look into this further for you. I used to have One plus (the $25 a month data service) and could only get around 5mbps download, so I dropped it and and using a Sprint ZTE Warp and get the same for $12/month unlimited & unthrottled. Recently I needed to use my T-Mobile Hotspot (S7 Edge &/or S8+). The best download I could get was .01 - .49mbps download. Called T-Mobile (tmo_chris) and was told I needed to sign up for the $25/month data service to use the hotspot and expect a usable speed. After about 24 hours I began getting download speeds of 20-35mbps on the phone with the extra charge. I'm still only getting way less than 1mbps download speeds on phones without the extra data service that used to get 5 or more mbps. I'm concerned that there's a setting on my phone I can't find - that T-mobile uses to raise & lower my hotspot wifi speed, that has nothing to do with T-mobile cell signal. Basically, T-Mobile has removed my back-up hotspot ability, unless I pay $25/month per phone extra. That is not how this works. Basically The base one plan has throttled hotspot data of 3g speeds. One Plus gives you 10GB of Lte hotspot data and the $25 plan gives you unlimited LTE hotspot data. Hotspot data is de-prioritized though(not hard throttled) regardless of the usage. Every carrier does this mind you so it is not out of the norm. T-mobile has no reason to degrade your service to unusable mind you, and signal strength alone is not indicative of fast speeds. I'm just comparing my hotspot service now to a few months ago. If I understand what you are saying 3g speeds have dropped from 5-6mb to less than 1mb download speeds since last fall where I live. This was on One Plus and way less than 10GB. The only way I'm getting LTE wifi speeds is by paying the extra $25/mo/phone. I'm trying to understand the relationship between 30-60mb download speeds to .01 wifi speed on the same phone using hotspot - One Plus gives you 10GB of Lte hotspot data. I swear T-Mobile is the best and it's been my main phone service since 2004. I don't believe they are degrading service. I honestly think this is some kind of bug or over site. 3g speeds I think is 512KB in there eyes. so that is the max you should be getting over hotspot without the one plus add on or after you use the allotted LTE data. Its in the fine print of the plan. They also say that phone use will be prioritized over hotspot data on the network. Although you should not be seeing.01 if you have the LTE data available. My issue is similar to what others have stated in this thread. I am on the Simple Choice NA plan with 10 GB of high speed data. I am not close to using all of my data. My data speeds are around 10 Mbps (or higher) download and 8 Mbps upload directly on my phone. However, when I USB tether to my laptop, data speeds drop to about 0.3 Mbps download and 0.1 Mbps upload. I have multiple lines with T-Mobile and multiple phones. It happens on all phones and all lines. The issue is not related to my location because data speeds on the phone are adequate. 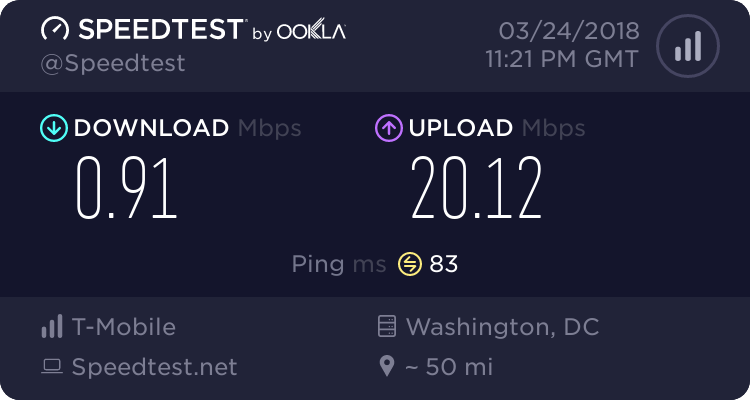 As soon as I USB tether, speeds drop drastically. The issue is not related to tethering to one particular laptop either. I have been having this issue for the last 1.5 years and in that time I have used several different laptops. Prior to 1.5 years ago, tethering speeds were fantastic. My T-Mobile plan has not changed during this time. My phones include a Galaxy S8 and a Galaxy S8+ (but the problem has happened with prior phones, as I mentioned). My phones are all T-Mobile branded devices. My current laptop is a Lenovo ThinkPad. I do not have to use a 3rd party app on my phone (USB tethering is built in to Android on the S8, S8+) and I do not need a 3rd party app on my laptop. When I turn on USB tethering, I get a proper connection. The issue is that it is very SLOW. Over the last 1.5 years I have called T-Mobile support many times regarding this issue. Tickets have been opened. Unfortunately, no solution. Usually the support person is very nice and promises to follow up with me. So far not a single person who has made me that promise has actually followed up. Multiple T-Mobile support reps have told me that my plan has no throttling of my 10 GB data allotment. I used to be a huge T-Mobile fan. I have had my current account for over 6 years with multiple lines. Before that I was with Verizon for 2 years, but prior to Verizon I was also with T-Mobile a long time. (I was a loyal T-Mobile customer even when their network was not as competitive as it is now.) If this isn't fixed, they will lose me as a customer, unfortunately. My question is, does anyone get good tethering speeds on a plan that is supposed to support them? BTW, is this the best place to ask my question? Or should I start a new thread? Your issue is definitely not normal. At first glance, one would think its hard ware related but with it happening on multiple devices and laptops, we should be able to rule that out. For this specific issue, a service ticket with our engineering teams is going to be the only way to get to the bottom of this. I understand you have had support tickets filed in the past and I sincerely apologize that you were not followed up with. What I would recommend, if you have a Facebook or Twitter account, you can use the links in my signature to message our T-Force team. They will be able to pull up your account and see a full history of your existing tickets and escalate them if necessary. Thank you for following up, Chris. I just called T-Mobile support. The person recommended one solution I have not tried: purchase the T-Mobile branded Alcatel Mobile Hotspot. Unfortunately, the online reviews of that hotspot are not very favorable. I think that may simply cloud the picture rather than prove to be a good solution. Your thoughts? The rep again confirmed that my plan (and usage) are not limiting my data speeds. Regarding T-Force, I quit Facebook and I am not regularly on Twitter. But I can call support again I guess... anyway, thanks for replying. You should not have to purchase another device. Your phones are more than capable of being use as a tethered or Wi-Fi hotspot. We usually see this problem but the other way around where the Wi-Fi is slower than the usb tether. I think the key to this one is to gather as much info as possible and have one of your existing tickets escalated with our over the phone tech support staff. If you are able to do a short testing session with your phone and laptop and mark the times of when you started with the Wi-Fi hotspot and the speeds you got and then mark the times you were USB tethering and your speeds, this will give our engineers a window they can look at to see if there is anything off. I also am suffering from tethering throttling. I am paying for the One Plus service, which should get me 3+MB speeds. Instead I get <100kbps. After spending 45 minutes with a T-Mobile tech rep he finally told me that the problem is my phone - a Oneplus 3T is not compatible with the T-Mobile network. I told him I had put the sim in a Moto X phone and an old Nexus 4 phone with the same results. I also told him that when I download a file directly to the phone I get over 4MB speed, so the problem isn't with the phone. I also told him that I had just recently (2 weeks ago) switched from ATT and the same phone and tablet were getting nearly 5MB speeds. Net result is that he said his only solution was to go to buy a T-Mobile phone. Sorry but I only use unlocked phones and am quite happy with my Oneplus phone. What I am not happy with is T-Mobile service, and I know how to fix that problem. I have done enough testing to know that T-Mobile is absolutely throttling tethered devices. Maybe they remove the tethering for T-Mobile branded phones, I don't know. But I know that this is a deal breaker for me. Are you over your data allotment? The one plus plan only has a set amount of data(10GB) in which you get LTE speeds after that you are throttled and that is made clear in the a earlier post in this thread. Also it is worth pointing out that T-mobile does treat hotspot data differently from normal phone usage. So it could be that the tower in your area is slightly congested since 4mb is not very fast for LTE. You should look into what band you are connected to when running the test and seeing if the location effects anything. It just sounds like you have not tried other spots and have a misunderstanding of what the one plus plan provides you. No where near my allotment - I've used less than 100MB (it's so slow I couldn't use 15GB in a year much less than a month). I have also tried a total of 7 different locations, all in strong signal areas. I never had to do any of this with AT&T - it just worked. When I measure the download speed directly to my phone I'm getting around 10-20mb/s depending on location, so I know the data channel can support the speed, but T-Mobile's literature specifically states that tethering and hotspot data will have a lower priority than phone data. What other explanation is there? Data direct to phone - 20Mb/s. Data to tablet through a hotspot - 50kb/s. The only way around the problem is to download files I want directly to the phone and then use direct wifi to transfer to my tablet. Hardly an ideal situation. since I got the iPhone XS and got put on senior 55+ plan my tether download speeds average 70-90 kbps which works out to about 4-5 meg per minute. I'd be quite happy to get the promised 3G download speeds of 512 kbps. I have the same plan as you (the 55 plus) and my tethering speeds are almost identical to yours--sure seems like some sort of throttling to me!